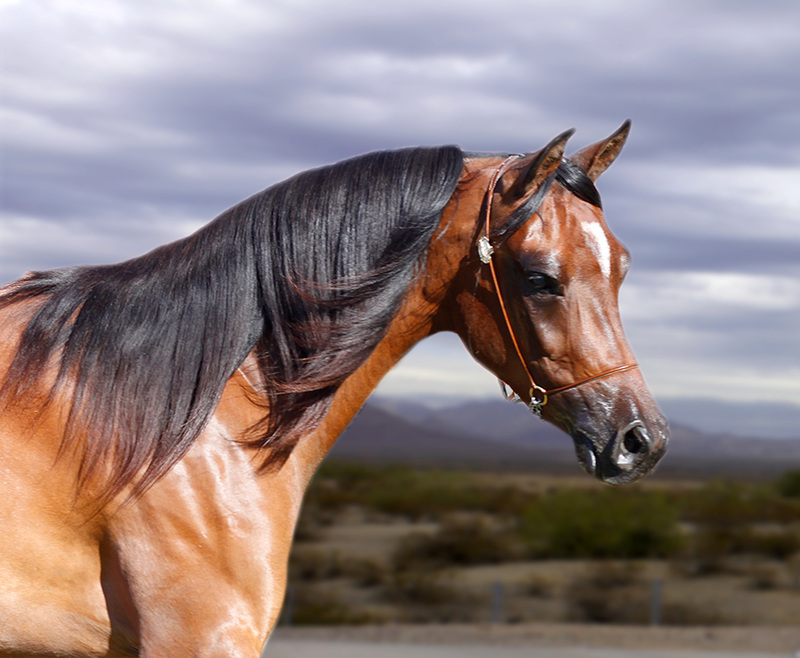 Ragman by Walter Wangerin, Jr.
PKH Miss Elegant Fame (Ellie) by THE COLOR OF FAME x PL DARQUE SATIN-- a 2000 NSH, bay Tobiano, HAHR*1A340346, is looking for a new home. 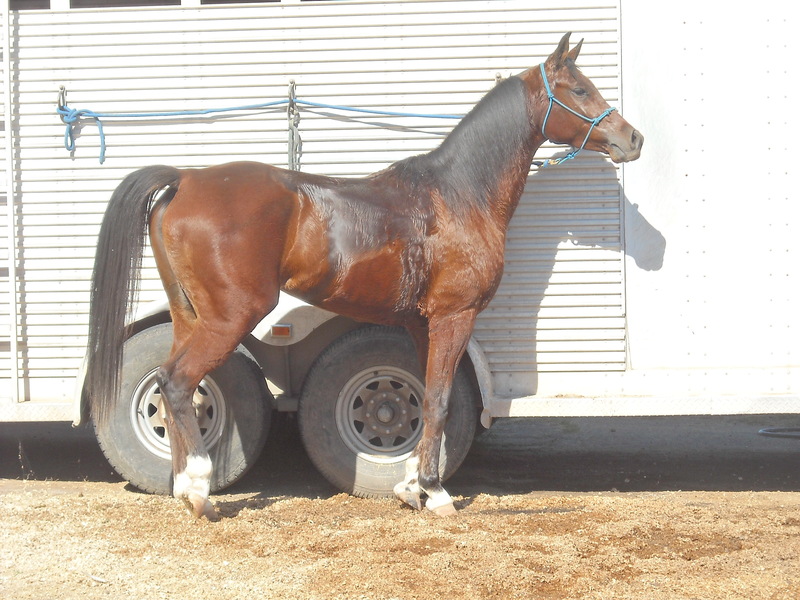 Flashy and has large forward trot. 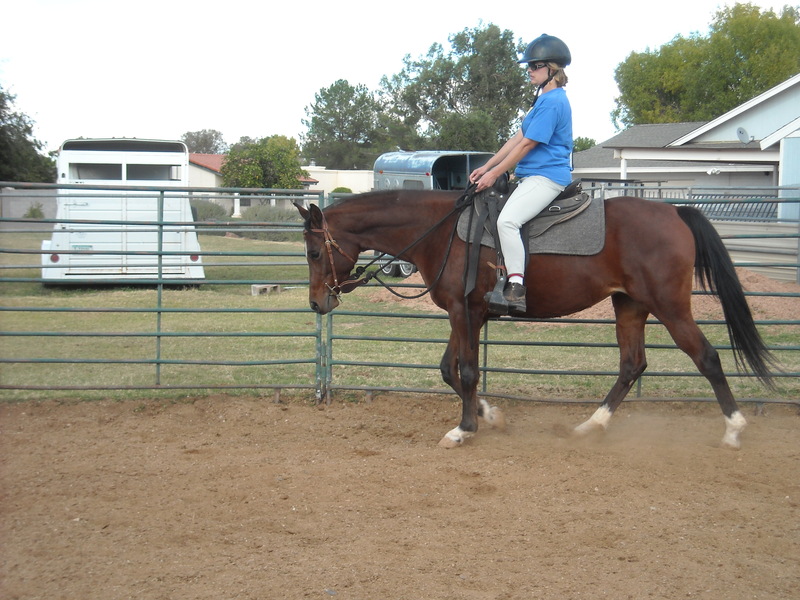 Was shown when younger, used as a lesson horse and has been used for pleasure riding the last few years. 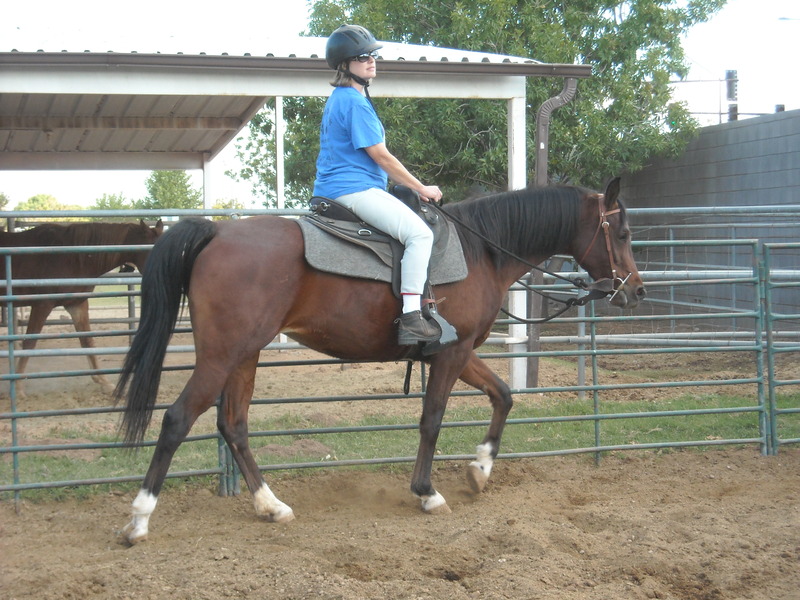 She is exceptional good with children and my grand daughter has ridden her for the last couple of years. 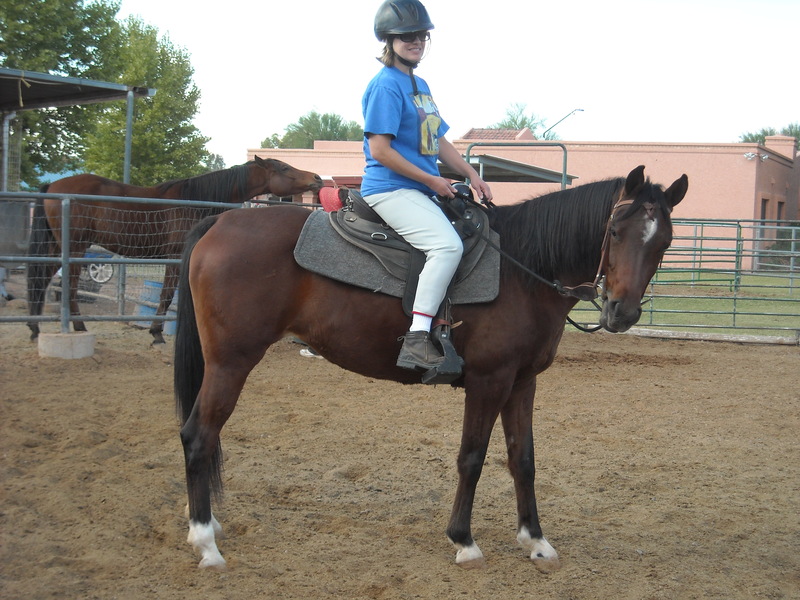 She now has a hunter jumper and so we need to find a new loving home for Ellie. Located in Gilbert, AZ. OK, Mom, can we be done with the picture taking? EmmiLee practicing her bending or could she be biting Michelle's boot? 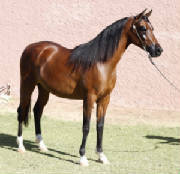 A beautiful 2008 Monogramm ~ Fame VF great-granddaughter. 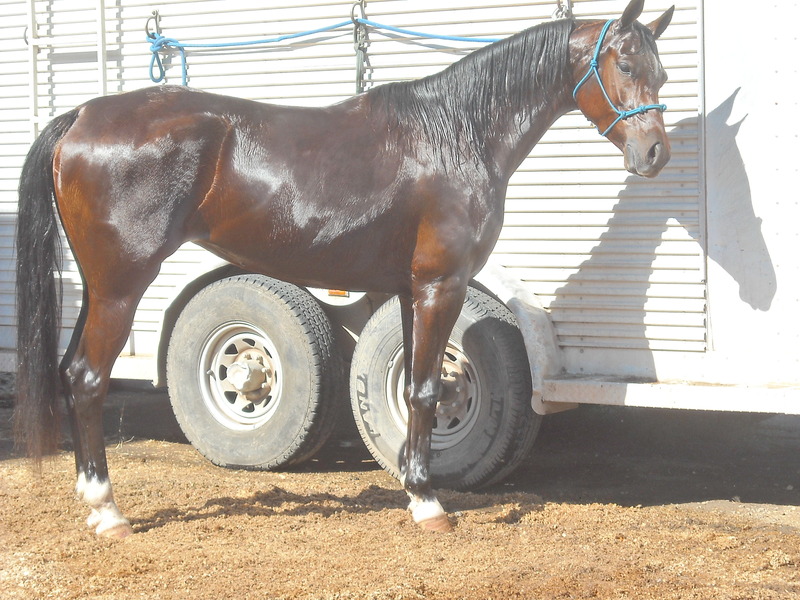 She is very easy to handle ~ good for farrier ~ halter trained ~ bathes and clips. for her -- she had to work! And to learn patience while being tied! That was hard! 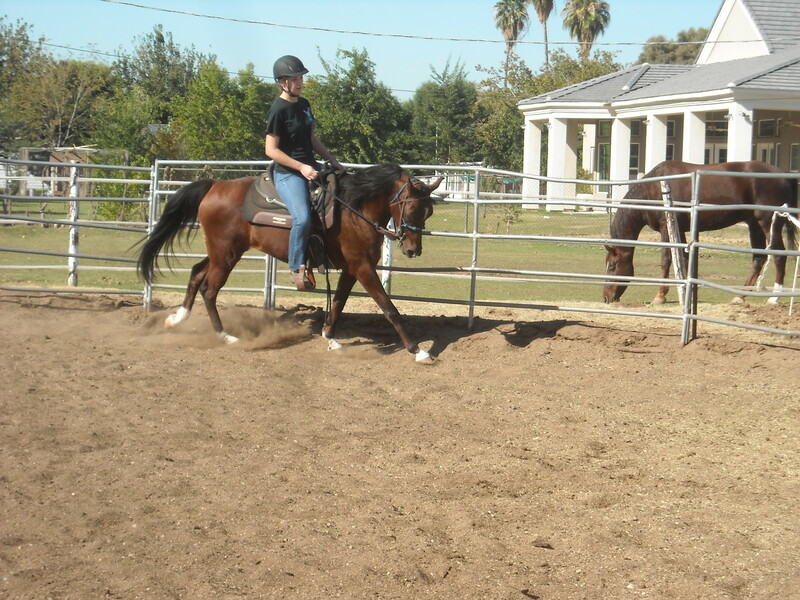 By January 2013, EmmiLee was making great progress and we were talking about taking her to a mini-circuit show. Our friend, Virginia, came down from Canada, for the month of February. 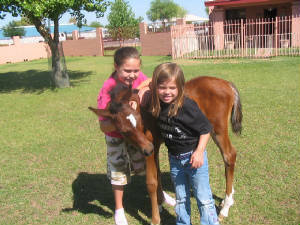 She was more than willing to ride EmmiLee and at the same time get some pointers of things to do with her 5 year old gelding. EmmiLee also learned how to "play" soccer! 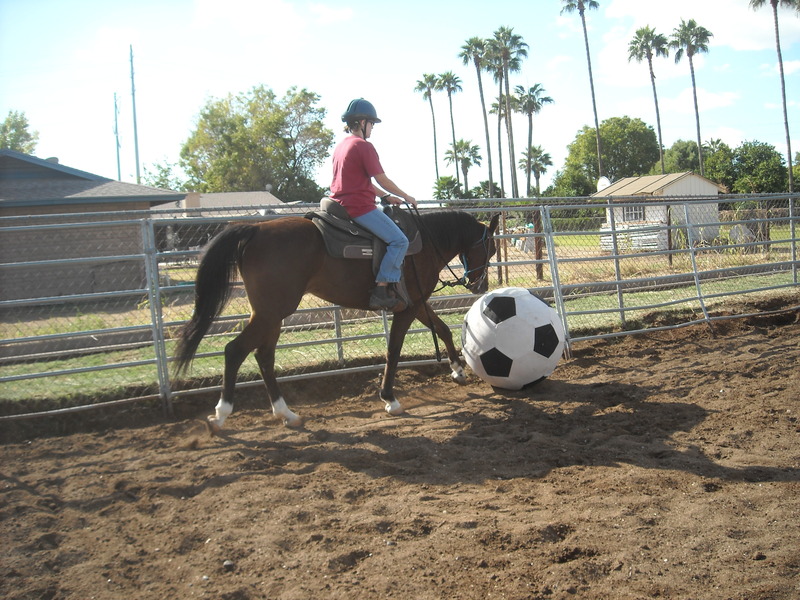 She really got good at pushing the soccer ball around with her nose and legs to move it around the arena. We did it at a walk and a trot. Way to go EmmiLee! EmmiLee was finally ready for her first show. 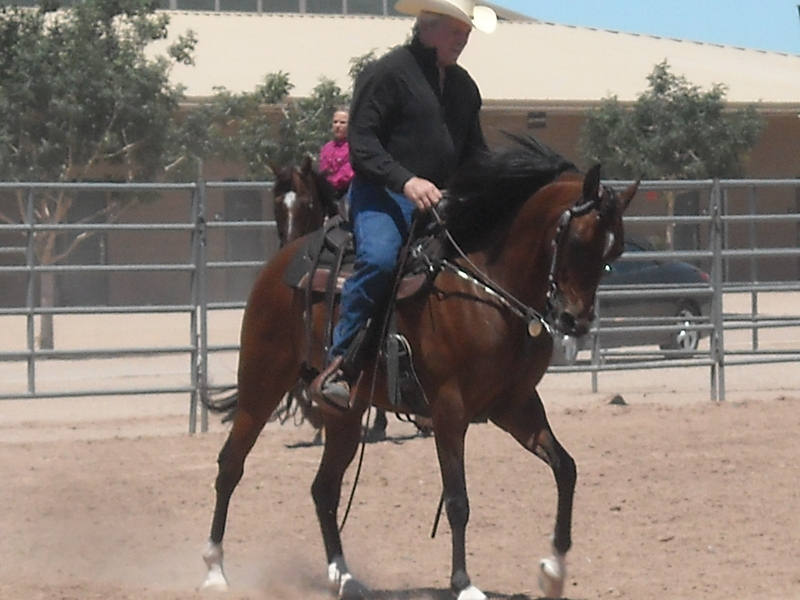 East Valley Arabian Horse Association's mini-circuit show was in March 2013. This photo was taken at their April show. 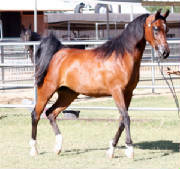 At the EVAHA mini-circuit show in April, EmmiLee won her first blue ribbon. Plus a couple more! 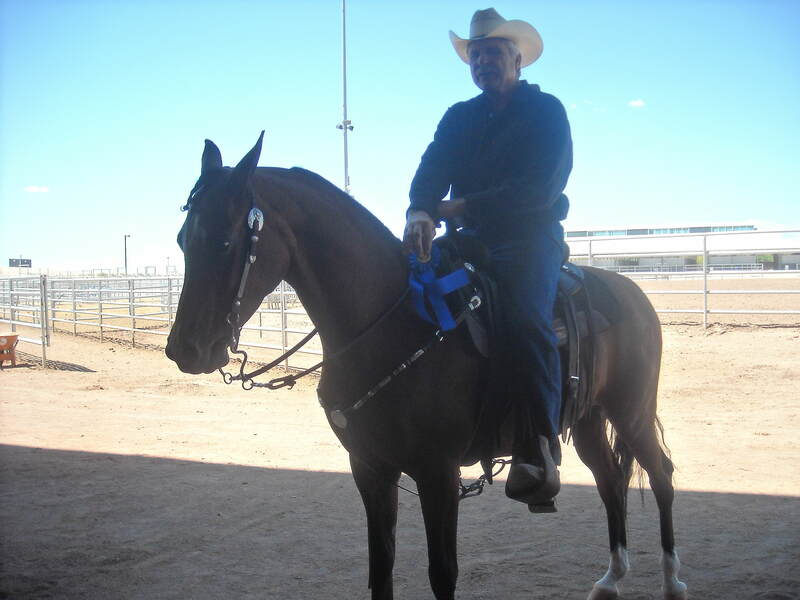 Finally, the highlight of the day -- EmmiLee won Reserve Champion in the last class of the day! What a thrill. 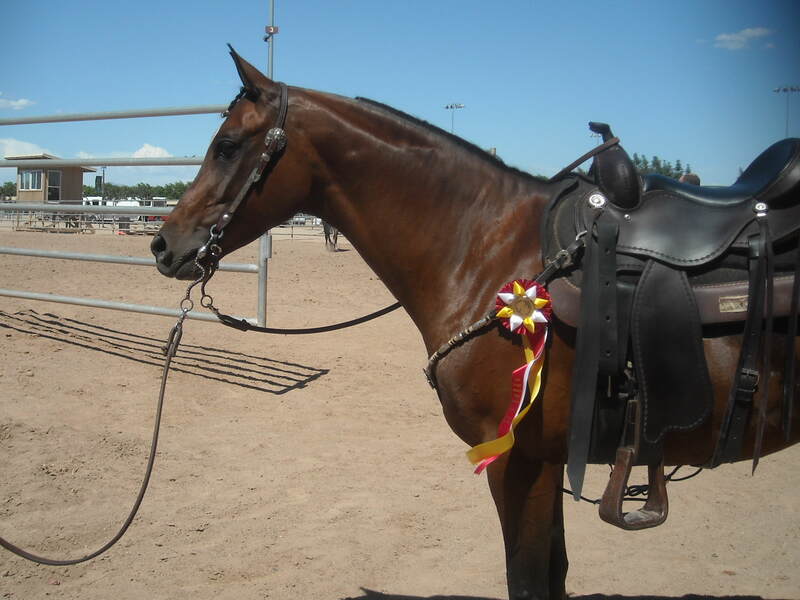 The best part of these shows, was to see how well EmmiLee handled the ring with other horses and how well behaved she was. 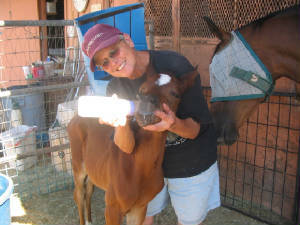 Here are a few snapshots of EmmiLee in the first few months of her life. There are some very recent ones at the bottom also. Enjoy! Emma & EmmiLee out exploring. The grand daughters really loved hugging on EmmiLee and she loved it too. 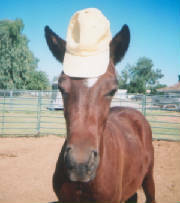 This is Arizona and a girl needs to wear a hat to protect her face.....EmmiLee at 5 months old. Well, a girl does have to grow up at some point and start learning a job. 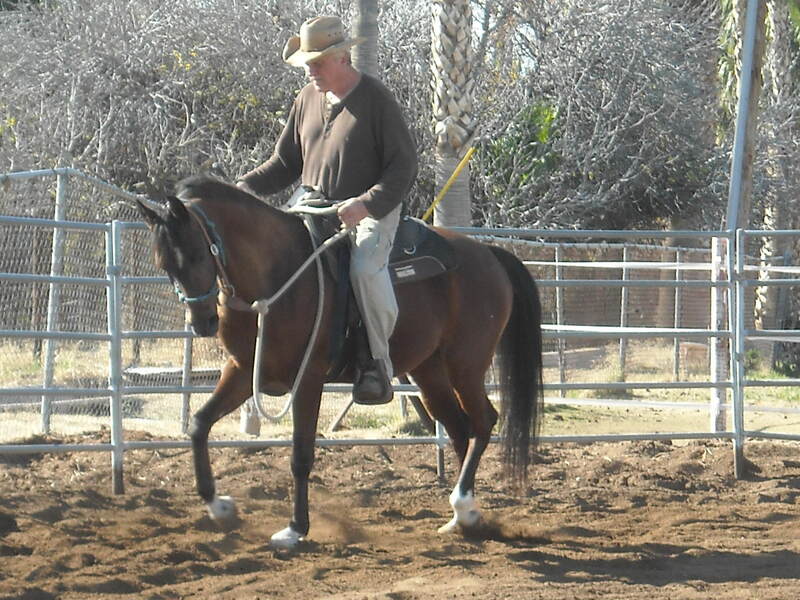 Even though I had all that "imprinting" in the beginning of my life, I have had to follow the rules and learn good manners along the way -- I am good when I am clipped, good for the vet/farrier and trailer fairly well (only been in one 2-3 times). 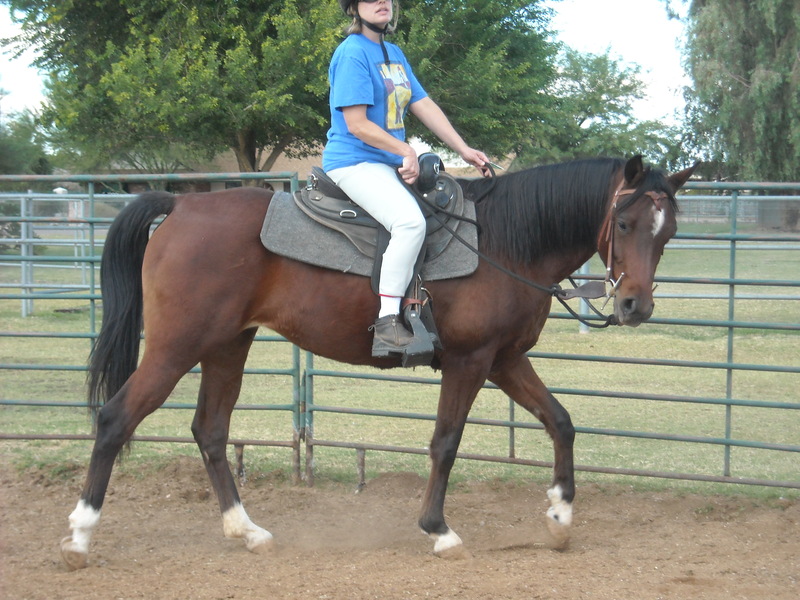 I am ready to start getting a saddle on, learning to give to the bit, and all of the other things that "big" horses do. 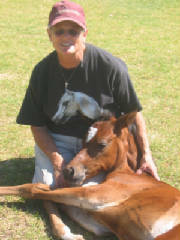 With her bloodlines, attitude, and early training you need to see EmmiLee in person and judge for yourself. 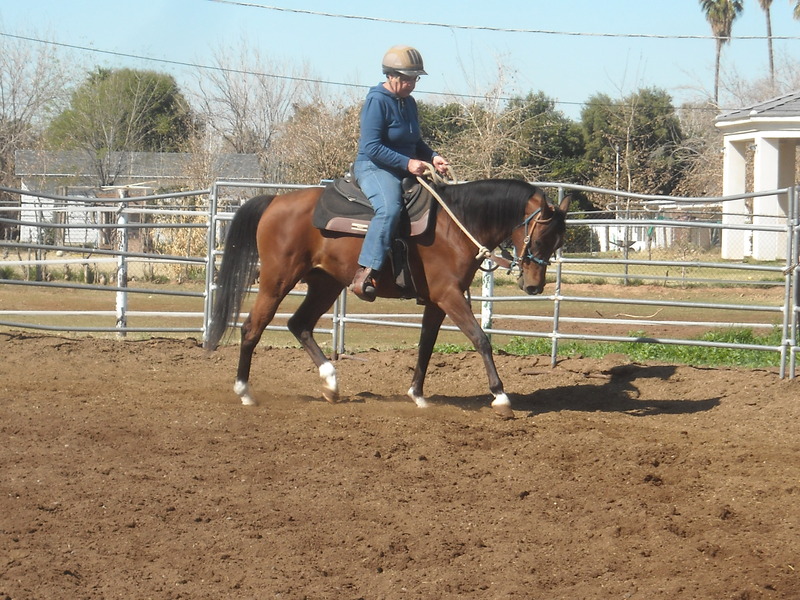 She will make a beautiful western pleasure horse or eventually a nice broodmare. 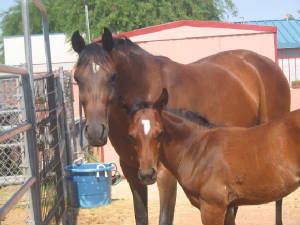 Think about how lovely she will be in a Western Pleasure class, or maybe a Trail Class or even in the Hunter Classes. 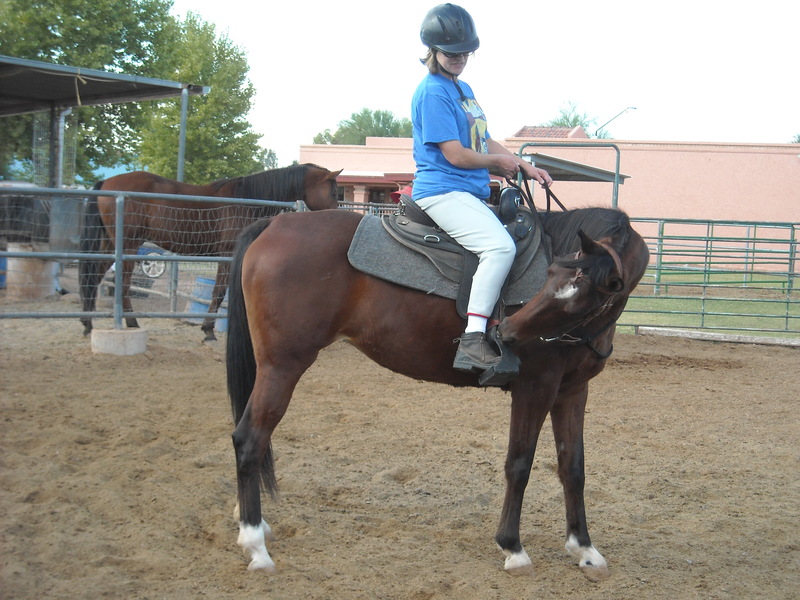 Please contact Mary at medeason@aol.com or phone 480-892-1260 to set up an appointment to see her -- you won't be sorry.